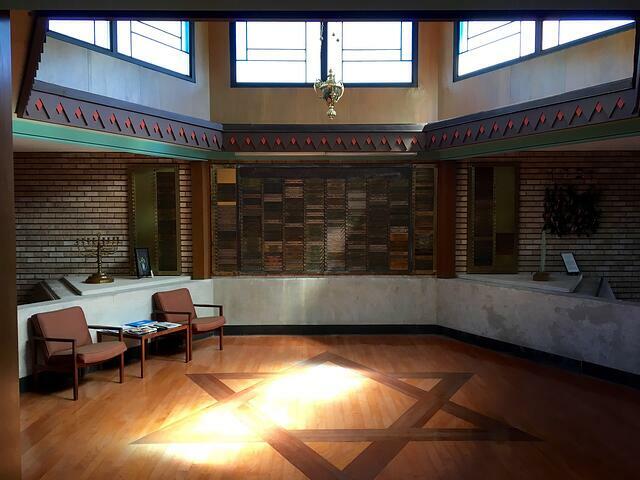 It seems entirely fitting as the Jewish Holy Day of Yom Kippur begins this evening, that I was fortunate enough to tour the interior of the remarkable Temple Rodef Sholom in Waco today. I blogged about this mid century landmark structure after I toured the outside several weeks ago. Now that I’ve toured the interior, I can say this design is truly a mid century jewel. 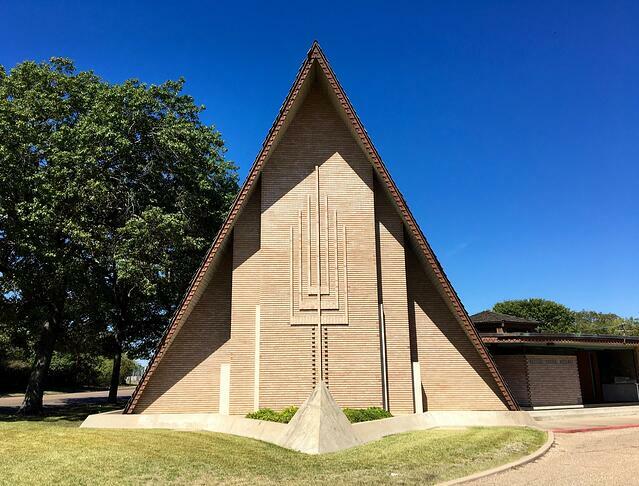 The practice of architects McKee and Kamrath, was highly influenced by Frank Lloyd Wright. The plan layout and so many details illustrate the connection. It is interesting to note that Karl Kamrath was friends with his mentor and promoted his concepts of Usonion architecture. The building’s interior is impressive. The wood detailing, the colors, the decorative motifs all relate to the exterior and are highly refined on the interior. At every turn, there are design elements that relate to the overall design. And the floorplan was very well thought out, with interesting connections as one space flows smoothly towards the next. 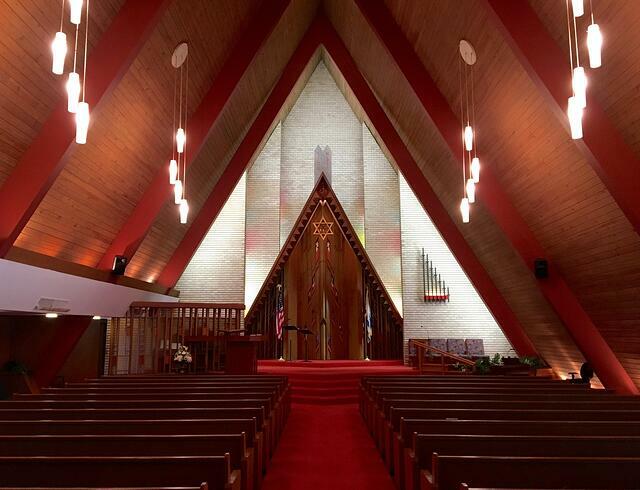 The forward thinking spatial arrangement continues to make this an effective place for worship while working for contemporary congregational activities. What also makes Temple Rodef Solom so special is that nearly all the original work remains intact. 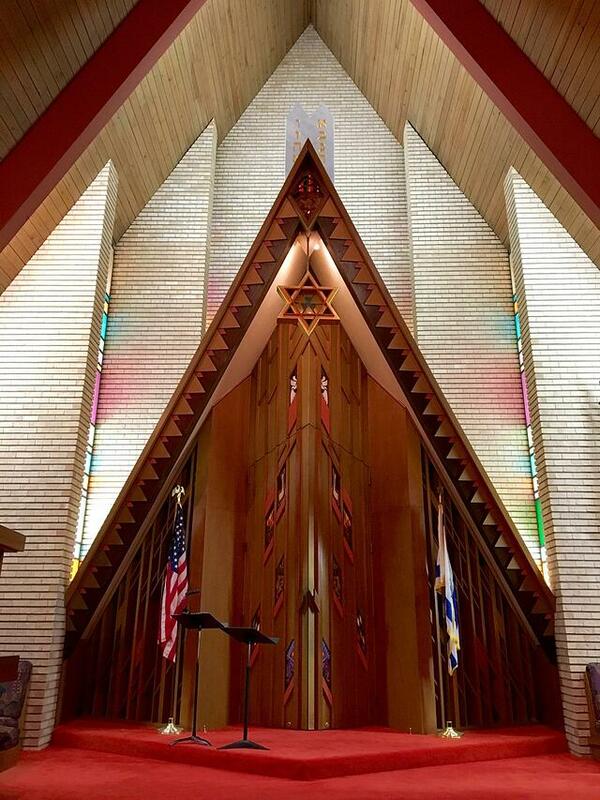 The sanctuary is designed around the focal point, the Holy Ark (Aron Kodesh), where the Torah Scrolls reside. This intricate design relates to the interior in materials and detailing. Windows from the sides bathe the Ark with subtle colors. And all the pieces are in place, nearly exactly as it was originally when the worship space was dedicated in 1961. Preparations for Yom Kippur, the holiest day in the Jewish year, were taking place as I toured the building. The flute soloist was practicing in the space and provided a haunting sound appropriate for this beautiful space.